The reformed Jane's Addiction and Tom Morello's new band Street Sweeper have two new tracks each available for free download. The songs appear on the website of the forthcoming Nine Inch Nails / Jane's Addiction tour, Ninja 2009. Morello's band Street Sweeper acts as support for the dates. Get the free tracks at the Ninja 2009 tour website. 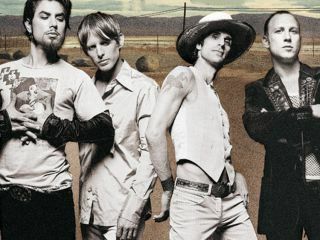 The two Jane's Addiction songs are new studio recordings of tracks from JA's 1987 self-titled live album - Whores and Chip Away appear as studio cuts for the first time over 20 years. NIN's Trent Reznor is producer on the tracks. The two all-new tracks from Tom Morello's new project Street Sweeper are Clap For The Killers and The Oath. Street Sweepers is a collaboration between Morello and The Coup's rapper Raymond 'Boots' Riley. Reznor also offers two new NIN tracks, Not So Pretty Now and Non-Entity. The downloads are in DRM-free formats of MP3, FLAC and better-than-CD 24/96 WAV files.